Hannah and Heartbeet were featured this month in The Christian Science Monitor’s “People Making A Difference” section! In 2000, Hannah Schwartz helped establish Heartbeet farm to offer care and opportunities for growth for adults with developmental disabilities. 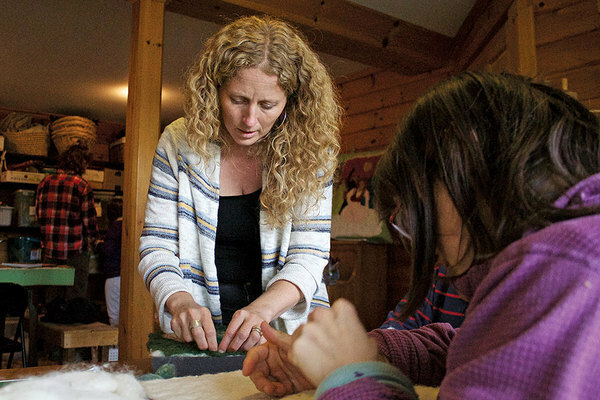 HARDWICK, VT. — In the basement of a house set into the side of green Vermont hills, half a dozen “friends,” or people with developmental disabilities, worked with volunteers to create wool feltings at Heartbeet farm one June afternoon. In the middle of them was Hannah Schwartz, who established the farm with her husband, Jonathan Gilbert. She needled away at a felting of a small barn with Sequoia Cheyenne, one of the friends, turning away occasionally to check on the progress of others in the craft workshop. That community, officially known as Heartbeet Lifesharing, is a residence offering therapeutic care and opportunities for growth for adults with developmental disabilities. It’s one of 15 Camphill communities and associated initiatives across North America, which are built on the idea that those with special needs should be included and valued, not warehoused away from the rest of the world. Schwartz brings a lifetime of relevant experience to Heartbeet. At the Hardwick, Vt., campus, she’s worked to create an integrated setting where her family, as well as co-workers and volunteers, all live with the residents. Schwartz’s work also goes beyond Hardwick: She speaks worldwide about the kind of model Heartbeet provides for adults with developmental disabilities. Schwartz’s parents worked at Camphill Village Kimberton Hills in Pennsylvania, and that’s where she grew up. “I loved my childhood,” she says. After attaining a college degree in special education and spending some time in the “real world,” Schwartz had some uncomfortable realizations. People looking to embrace a more community-oriented, neighborly lifestyle find themselves at home at Heartbeet. Marcianna Morse and her husband, Dan, are raising their child there. Ms. Morse, who has been on the staff for 4-1/2 years, says she decided to live at Heartbeet after having lunch there one afternoon. “I stayed because of the commitment to the human relationships and the opportunity to heal and share and grow,” she says. Her family joins Schwartz, the other co-workers, volunteers, their families, dogs, cats, and 17 residents who live in the Heartbeet houses. Outside the residences, the farm has a renovated barn for dairy and beef cows, goats, chickens, and pigs. It also has a greenhouse, garden, and wood shop. In pursuit of sustainability, between 50 and 60 percent of the community’s food is produced on the farm, Schwartz says. While everyone rotates in and out of barn chores and housekeeping, she says, Heartbeet also runs vocational workshops that are organized according to residents’ interests. On that June day, for instance, residents Suzannah Dickinson and Ann Blanchard were in the garden helping place wire cages around some wilting tomato plants. Both women have extended their work past the farm. Ms. Dickinson packages cheese at Jasper Hill Farm in nearby Greensboro, and Blanchard just retired from helping out at the local food co-op. Residents have other opportunities to be involved in the region, too. The felting artwork – which is framed by residents in the wood shop – gets sold throughout the Northeast, and residents can lead demonstrations in community classes. Loneliness, Schwartz says, is never a problem at Heartbeet. “You get a group of people and you learn how to create meaningful lives,” she explains. To help with that process, each house meets weekly to discuss social events and conflicts, and each person gets a three-minute “check-in” to talk about how he or she is doing. “We end up being able to take care of each other,” Schwartz says. Schwartz cofounded Heartbeet in 2000, after coming upon two people with developmental disabilities who were living in Hardwick. Seeing the inadequacies of their two options – home care or independent living – she felt there was a better way. At that moment, she was “called” to bring the Camphill model to Vermont. The groundwork was already in place: The state is made up of small towns, emphasizes direct access to elected officials, and values the environment. She chose the site of a former 150-acre dairy farm in Hardwick, a onetime quarry town. It was located on Town Farm Road, on land previously used for the “town farm,” where work and shelter were provided for those on the periphery of Vermont society during the early 19th century. Now, Schwartz is working to bring more people from the region to Heartbeet. The organization just bought 58 more acres in the neighboring town of Craftsbury, with plans for a new house and therapeutic riding center that will be open to the public. Heartbeet also has an almost-completed community building where various organizations, businesspeople, and performers will hold events. “Every event will include adults with developmental disabilities,” Schwartz says. This past spring, she and some residents visited the Vermont State House at the invitation of Representative Troiano. Troiano says he has been continually impressed with what Schwartz has built. “This is the model,” he says. Schwartz says she’s gotten a lot of support for that model in Vermont, and she now regularly travels to spread it further. She most recently returned from giving a talk in Israel.